a2b Fulfillment, a third-party logistics provider with a specialty in order fulfillment, customer care and value-added services, is a Solution Provider Sponsor at the Seventh Annual Georgia Logistics Summit. 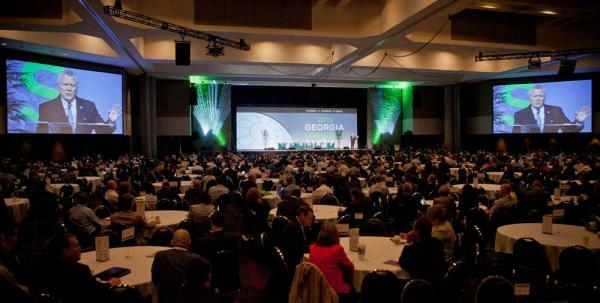 The event is hosted by the Center of Innovation for Logistics on March 31st – April 1st in Atlanta, GA.
Last year more than 2000 attendees from nearly all the states and several different nations attended the Summit. Many industry leaders are lined up for informative and insightful presentations throughout the event. Summit attendees will have an opportunity to interact and share their perspectives on Georgia logistics providers, potential service improvements and industry trends. This year’s program begins with a discussion titled International Logistics: Partnerships & Possibilities where attendees will learn about and discuss business opportunities with experts from around the world. Panelists will provide insights into the markets of Germany, Mexico and Vietnam and the logistics environment in those countries. During the lunch period, attendees will have time to visit the many exhibitors who offer valuable services to the logistics industry in Georgia. Visit with a2b’s Allison Chesnutt, who will be happy to demonstrate how a2b Fulfillment can be part of your logistics program in Georgia. Next is a panel discussion on The Logistics of Manufacturing. Attendees will interact with some of Georgia’s most prominent and upcoming manufacturing companies sharing insight into how they plan to compete and grow in an ever changing global economy. The final session on the first day will be the Keynote Panel Discussion: Growth & Expansion in Georgia. Hear real-time updates on the current and future plans of some of Georgia’s newest located and expanding logistics-enabled companies. Day 1 concludes with a networking event that is certain to provide ample opportunities to make strategic relationships. Ed Crowell, Executive Director, Georgia Motor Trucking Assoc. Charles Tarbutton, President, Georgia Railroad Assoc. Later in the morning there are Opportunity Sessions on E-commerce, Intermodal and Perishables. These 3 concurrent sessions include over 15 speakers from private-industry logistics consumers. Each session is focused on a high growth market and how supply chain and logistics operations are designed, impacted and can enable this growth. The keynote speaker this year is Craig Menear, the President & CEO of the world’s largest home improvement store, The Home Depot. He and his team successfully executed one of the most dramatic supply chain transformations in retail history. Hear him speak while enjoying a formal lunch in the grand ballroom. Finally, the Summit offers ample opportunities for networking and visiting with potential clients and vendors. “a2b Fulfillment can provide many different solutions in Georgia logistics for Summit attendees. We look forward to meeting with and sharing our expertise with companies of all sizes and industries” invites Allison Chesnutt, Business Development Executive at a2b Fulfillment.